In Kings And Priests we discussed John’s trip to Heaven, where he saw a symbolic representation of the composition and organizational structure of the Armies of Heaven, comprising Christ and his redeemed saints, that will establish and reign over the promised kingdom. The heavenly pattern he saw comprised One that sat on a central throne, twenty-four Elders on lesser thrones, and four Beasts, likened to a lion, a calf, a man and an eagle (see Revelation 4:1-5:10). In this article we will begin an attempt at interpreting some specific aspects of this pattern, by which I hope we would gain further insight into our coming earthly reign with the Lord and receive practical motivation to “keep the faith” in the midst of present challenges. This is what the apostle meant by “the eyes of your understanding being enlightened; that you may know what is the hope of His calling, what are the riches of the glory of His inheritance in the saints” (Ephesians 1:17,18, NKJV). The first question that strikes the mind of the interpreter of this heavenly pattern of the Armies of Heaven that John saw is: Why twenty-four enthroned Elders? Why not twelve, the number associated with divine order and government? After all, it was twelve apostles that the Lord promised twelve thrones over the twelve tribes of Israel. Moreover, the New Jerusalem City, another remarkable representation of the Armies of Heaven that we considered in In My Father's House, has twelve gates, is twelve thousand furlongs long, twelve thousand furlongs broad, and twelve thousand furlongs high. Truth is, twenty-four equals twelve times two. But why must the twelve be multiplied by two? To answer this question we will revisit the Lord’s Golden Promise of the kingdom. The Lord said to His apostles, “Verily I say unto you, That ye who have followed me, in the regeneration when the Son of man shall sit in the throne of his glory, ye also shall sit upon twelve thrones, judging the twelve tribes of Israel” (Matthew 19:28). He restricted the promise of the kingdom to the twelve tribes of the nation of Israel, and hence spoke of twelve thrones, because that was the extent of His earthly ministry at that time. He instructed His disciples, “Go not into the way of the Gentiles, and into any city of the Samaritans enter ye not. But go rather to the lost sheep of the house of Israel” (Matthew 10:5,6). It was after His death, burial and resurrection, and just before His Ascension into Heaven, that He notified them of the full extent of His redemptive work. At that latter time he said, “But ye shall receive power, after that the Holy Ghost is come upon you: and ye shall be witnesses unto me both in Jerusalem, and in all Judea, and in Samaria, and unto the uttermost part of the earth” (Acts 1:8). This, as the testimony of the Elders and Beasts also indicate (see Revelation 5:9,10), is the full extent of redemption by His Blood and will also be the full extent of His coming kingdom – “unto the uttermost part of the earth.” The Almighty said to His anointed One, “Ask of me, and I shall give thee the heathen for thine inheritance, and the uttermost parts of the earth for thy possession” (Psalm 2:8). The apostle Paul explained it further in his epistle to the Gentile Christians at Ephesus, and in so doing nailed down the two that we are in search of. He wrote: “That at that time you were without Christ, being aliens from the commonwealth of Israel and strangers from the covenants of promise, having no hope and without God in the world. But now in Christ Jesus you who once were far off have been brought near by the blood of Christ. For He Himself is our peace, who has made both one, and has broken down the middle wall of separation, having abolished in His flesh the enmity, that is, the law of commandments contained in ordinances, so as to create in Himself one new man from the two, thus making peace” (Ephesians 2:12-15, NKJV). That’s it! 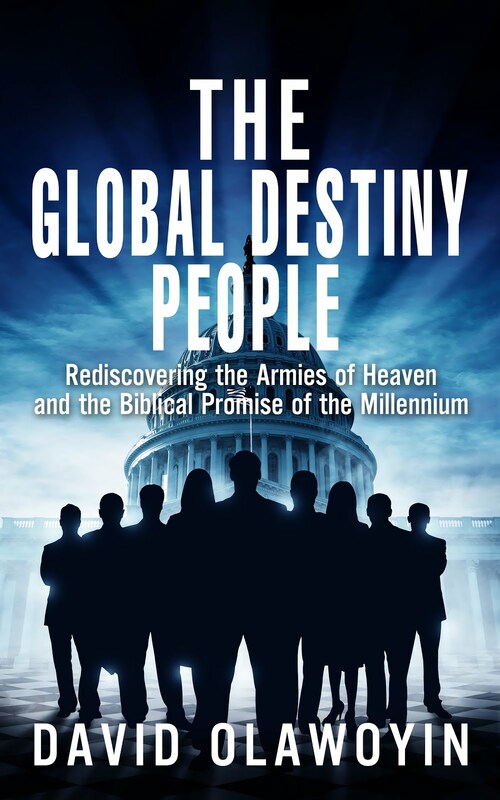 That’s the two we are in search of: it is the “both,” the “two” major races of people involved in the divine plan of redemption – Jews and Gentiles! They are to be united in one kingdom, the Commonwealth of Israel, as the apostle puts it. That’s the reason why we have twenty-four – twelve times two – enthroned Elders in the heavenly pattern of the Armies of Heaven that John saw. It signifies the global extent, encompassing Jews and Gentiles, of the kingdom of divine order and government that they will establish and reign over. The twelve thrones that the “King of kings” mentioned in The Golden Promise, while His ministry was still restricted to the Jews, have been multiplied by two to include the Gentiles. Notice that it is the same Greek word thronos that is translated “throne” and “seat” in Revelation 4 of the King James Version of the Bible. The “seats” used for the thrones of the Elders reflects their subordination to the central “throne” of the heavenly scene, symbolic of the throne of Christ in the kingdom. The fact that the Elders are crowned confirms that they are kings and their seats are thrones. But this is just the beginning of our attempt at deciphering the symbols. There is much more to this pattern of the twenty-four crowned Elders. Who among the saints do they actually represent? And exactly what position will they occupy in the coming kingdom? This is part of what we will be exploring next week. So keep the faith, and remain posted. Need to digest all this..Lots of revelations and info. God bless you and give you grace.